As many women experience menopause and its accompanying symptoms, including hot flashes, they may seek a variety of treatment options to manage their symptoms. Caused by a sudden increase in body temperature, hot flashes are feelings of extreme heat coursing through the body. Hot flashes make women sweat profusely and feel very uncomfortable. Hot flash episodes can last anywhere from a few seconds to several minutes, varying in intensity. Exercise. Getting regular exercise can be extremely effective in reducing the severity of hot flashes because it helps to regulate and stabilize the body temperature. Drinking water. Keeping the body well hydrated means that the temperature stays relatively stable and is less likely to rise suddenly. Wearing breathable clothing. Light cotton clothing is the best for women who want to reduce the likelihood of a hot flash episode. The lightness of the fabric keeps the body cool and resistant to sudden changes in body temperature. Avoid hot drinks and spicy foods. 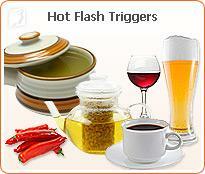 Hot flashes can be reduced if you modify your diet. This includes reducing your consumption of spicy foods, hot drinks such as coffee or tea, and chocolate, since they can trigger symptoms. It may be worth consulting a doctor about finding alternative therapies to treat hot flashes. Many women, for example, turn to alternative medicine, such as herbal remedies and acupuncture, for their hot flash aid due to their low risk factor. If lifestyle changes and alternative therapies do not work, women can treat their hot flashes through medications and surgery, most commonly through hormone replacement therapy (HRT). HRT should be a last-resort option for finding hot flashes aid due to its potential side effects. A hot flash treatment is usually needed for women in their late forties and early fifties, but symptoms can begin for women in their early to mid thirties if they experience early menopause. Menopause and hot flashes begin at different times for every woman and treatments should be sought according to individual need. The National Institute of Health. (n.d). "Signs of the Menopausal Transition." Retrieved from www.nih.gov.